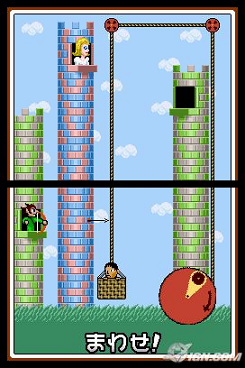 i seem to be repeating 2009 so far, having started with a new super mario bros. game this year and then following it up with a warioware game. i’ve been working my way through the warioware series, and playing through rhythm tengoku and part of rhythm heaven reminded me that i still have a few warioware games to play. 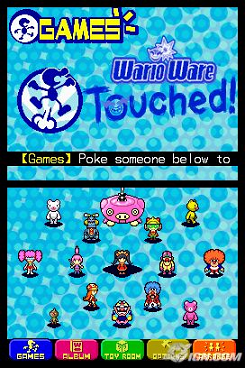 i wasn’t particularly looking forward to warioware: touched! for DS which seems to have gotten good but not great scores overall. the game was about what i expected, namely a warioware game that utilizes the new hardware well but that doesn’t really offer many surprises. it was one of the launch titles in japan and came out just a few months after the launch in the US, and at the time it was probably enough to just revel in the DS’s brand-new capabilities. but now, more than five years later, the game’s mechanics have been seen in many, many games since then, and the microgames themselves also feel overly familiar and the in-game toys much more throwaway. it also doesn’t help that the game is imo the easiest of the series either. on the gonintendo boards one user described the series as becoming little more than a bunch of tech demos, and in some ways touched! does feel that way. i haven’t played snapped! yet, but i feel that smooth moves still keeps the fun factor even while showing off the wii remote’s capabilities. it’s been a while since i played it, though, so i’ll have to try it again now that i’ve had several more warioware games and many more wii games under my belt. not much more to say. smooth moves and twisted! are my favorite warioware games so far and i don’t expect that to change anytime soon, but i will play through the remaining ones. i’m not a big fan of creating my own content in games, so there isn’t much about the forthcoming warioware D.I.Y. (due out in just a couple of months) that sparks my interest, but maybe i’m underestimating the potentially great user-generated content that will be available. i’ll try to keep an open mind anyway. for wario’s sake. bwahahahhaha!